In mid-June, the European Investment Bank (EIB) and Belfius announced the creation of a credit line of 400 million Euros to finance, at preferential interest rates, public sector projects allied to sustainable development. 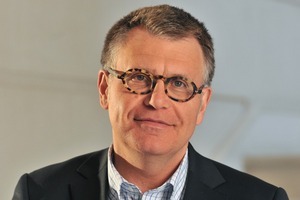 According to Pierre-Emmanuel Noel, Senior Banker at the EIB, the objective of the Smart Cities & Sustainable Development programme is to assist and financially support cities and communes in their projects, and more specifically in three domains: mobility, urban rehabilitation and energy efficiency including renewable energies. While this programme is arousing much enthusiasm, the obstacles in the way of realising it are not to be under-estimated. Various initiatives are emerging for assisting local public authorities and for bringing cities together with companies, industry, SME’s and the academic world for the conception and realisation of projects based on the long term. There has been a major joining of forces within two of the most prominent players on the Belgian real estate development market: Allfin has purchased the 29.85% stake from Cresida Investment in Immobel. 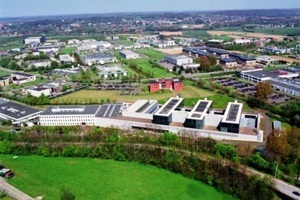 The Allfin holding company is specialised in the development of high-end office buildings along with residential, commercial and mixed-use projects in Belgium and Luxembourg. It was established in 2001 and is 100% in the hands of Marnix Galle. 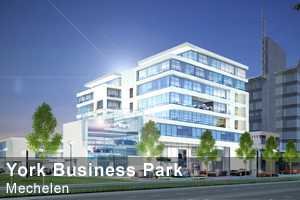 Over the past 13 years, Allfin has developed over 220,000 m² residential, office and retail space for more than € 790,000,000. Allfin is currently best known for the ongoing redevelopment of exceptional sites such as the former head office of Solvay in Ixelles (Ernest project) and the historical headquarters of the ASLK/CGER bank in the heart of Brussels (Chambon Project) and new developments in prime location such as Belview in the European Quarter or Vesalius in the centre of Leuven. 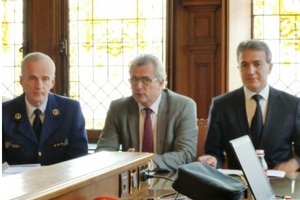 Earlier this month, in a demonstration of inter-communal cooperation, the mayors of Schaerbeek (Bernard Clerfayt) and St.-Josse (Emir Kir) announced a new police headquarters building for the Brussels-North zone. The police building is designed to be welcoming, highly visible with a prominent logo on the corner, and will help in the desire of the communes to transform the district from a red-light only destination to a place people feel comfortable in visiting. This building, familiar to motorists as they emerge through the railway tunnel next to the Gare du Nord, is located alongside the Chao Chow hotel. The two mayors did not try to conceal the problems of this zone. Emir Kir said the desire was to adopt the ‘Antwerp model’, containing the prostitution activity rather than either trying to eliminate it, or letting it operate in a totally unregulated manner. 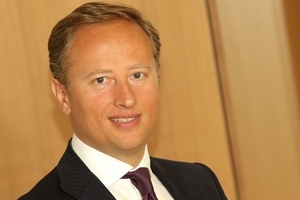 Colliers International has announced that it has taken a majority shareholding in AOS Group in order to strengthen its foothold and extend its activities in Europe. 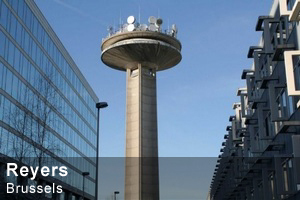 AOS is renamed ‘Colliers International’ in Belgium, in France and in the other five markets within which it operates. The location of Colliers International at Antwerp in Belgium is relatively recent (2002) and modest compared to the size of this worldwide company which numbers over 15,800 members of staff in 63 countries. In the countries were AOS operates, the acquistion of AOS enables Colliers International to extend its range of real estate services, in particular with advice and project management in the domain of the organisation and fit-out of work spaces. 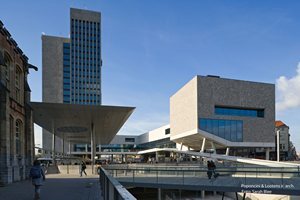 The Ghent VAC (Vlaams Administrief Centrum) came into being via a Public Private Partnership according to the DBFM formula, with Eurostation, Kaïros and the Flemish Agency for Facilities Management, (from the Flemish authorities) as partners. 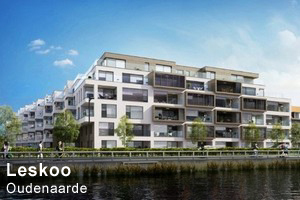 Thanks to an architectural concept emphasising a hermetic construction and maximum insulation, the Ghent VAC is not only the largest – with a surface area of 40,000 m² – but also the least energy consuming of the five VAC, with an effective score of E50. Since June, the building has been home to some 1,300 civil servants. But that is not the end of the matter, because the capacity of the building is 1,548 work stations. 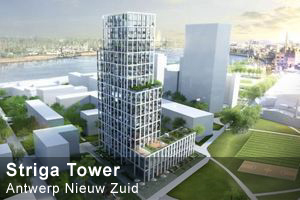 It is therefore scheduled that in 2015 the East Flanders fiscal public service will move in to this Ghent site. 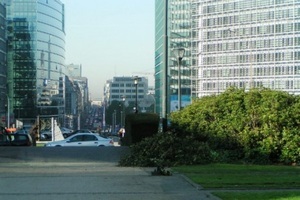 With the granting of the environmental permit for the ‘Europa Tower’ on the Rue de la Loi in the European district of Brussels, some of the parking problems in the district may be made worse. This is the view of IEB (Inter-Environnement Brussels), which points out that when taken together with the environmental permit for the neighbouring ‘Leaselex’ tower, these permits will allow for 380 new parking spaces. The organisation says that while the Region is intent on densifying the zone, it is not paying enough attention to mobility problems, and that it is imperative to reduce traffic pressure. The IEB also says that the Zoned Urban Regulation (RRUZ) allows for 164,000 m² of extra office space in an area which has 229,000 m² of vacant space. The ‘Monnoyer’ which accommodates 350 members of staff of the high tension electricity network manager ELIA, is the most spacious illustration of an architectural solution which is respectful of the environment. Lagooning, photovoltaic panels, certified, recyclable and indigenous materials, the reintroduction of biodiversity… This office creation by Architectes Associés has been named an Exemplary Building by Bruxelles Environnement and conforms to BREEAM standards. And on top of this, the Monnoyer is the first building of this size to be classed as Zero Energy (NZEB – Nearly Zero-Energy Building) in Brussels. At the end of September, the Vaartstraat #94 project was officially opened by Leuven mayor Louis Tobback; this is a student housing development, comprising some 256 rooms in a former office building which was completely retained and converted by architects Jaspers-Eyers, developers Virix and energy and engineering firm VK. The project was developed in close collaboration with the Catholic University of Leuven (KUL) and meets the university’s high quality standards. The highest standards were also incorporated in terms of energy use. VK points out that the original objective of E30, corresponding to a ‘nearly-zero energy building’ (NZEB), was subsequently raised to the completely energy neutral E0. The city of Brussels, ranked 9th in the ‘European Green City Index’ is seeing the emergence of several urban development initiatives. 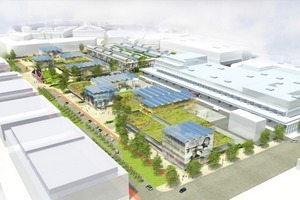 Last November, the then Brussels Minister for the Environment Evelyne Huytebroeck laid the first brick for a 3,000 m² urban farm to be established on the roof of the new food hall at Anderlecht. This urban farm forms part of the development and repositioning project for the Cureghem abattoirs, being developed by site owner Abatan. This project, partially financed by the Brussels Capital region and the FEDER European fund, includes the creation of a logistics platform for urban distribution, designed to rationalise the distribution of merchandise in Brussels from the TIR centre by using non-polluting vehicles.